Cyber security awareness month, week 5 on 30-31 October. October is the cyber security awareness month. This is the fifth and last week of the cyber security awareness month. Population across the globe depends more and more on the internet. Hence, everyone should know the threats in the online world. The cyber security awareness month looks to spread awareness about the same. Additionally, online security, the threats lurking online and what you can do to prevent it are some of the main topics of discussion. The fifth week (October 30th and 31st) of the cyber security awareness month has a theme: Protecting Critical Infrastructure from Cyber Threats. Week 5 will address topics concerning the cyber security with respect to keeping our traffic lights, running water, phone lines, and other critical infrastructure safe. In this aspect, we must also mention that Le VPN has a special promotional offer this month. You can subscribe to Le VPN’s 2-years VPN service for 69 USD or 2.87 $/month. What Are The Various Cyber Threats Online? Malware is basically a term to denote all kinds of threats online. This can include worms, Trojans, viruses and so on. It is a kind of code that enters your device or computer and then destroys the data or steals it. It can be a leak or a breach. Now, malware is usually brought into your system through email attachments from unknown senders, software downloads and so on. This is precisely why it is advised you shouldn’t download attachments sent by people you don’t know. Phishing is another common threat online. People would send you a mail requesting data. And you get a link to an unknown website. There you will be asked to insert your own information, like personal details. Nowadays, phishing has become all the more sophisticated. And, you wouldn’t be able to identify a phishing mail from a legitimate request. If you get a suspicious mail, it is always better to verify the source. Passwords attacks are pretty common. This is as the name suggests – people or hackers trying to get access to your accounts by cracking the passwords. The attackers basically use a kind of software application which would try to crack your password. There are brute force attacking systems which attempt to guess your passwords. The best way to prevent such an attack is to get hold of a strong password, with complicated combinations of numbers and characters which can help protect you. 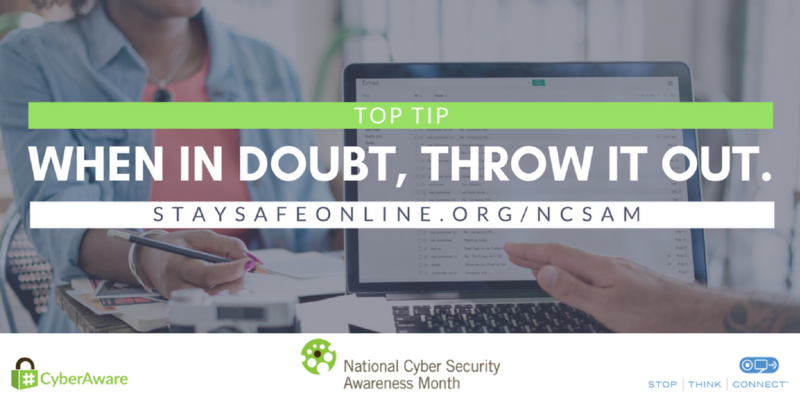 During the cyber security awareness month, educate yourself about the dangers of visiting random websites online. The website may be legitimate, but the moment you visit it, a program or software application may be downloaded to the website unknowingly. This may pose a threat to your system. Generally a VPN is useful to bypass geo-restrictions. For example, if any content is not accessible in your area, then you can easily access it by changing your IP address to a country where the content is accessible. That means any Australian content can be seen from your area by using VPN Australia. Irrespective of whether you are using a VPN or proxy servers, always keep in mind the above given common cyber threats. Go for Le VPN’s services this cyber security awareness month and stay safe in the virtual world.